I by Rosie Gailor is an unflinching beginning, treading the dream state between waking and drowning within the confines of a bathtub. Jane Robert’s Breathless sweeps us into similar territory, with Jane’s recognisably sultry style shimmering through even in moments of encroaching darkness. From here on in, the texture of the tales grows increasingly intriguing, with a single thread requiring the gentlest of tugs to unravel the mysteries hidden within. In As Linda Was Buying Tulips, Sarah Dobbs moves us onto the headiness of art, desire and food, and her narrator’s descriptions are lip-lickingly enticing. “The kitchen was a moist well of cinnamon and apricot. Silence when they caught me watching. Beads of water drip-dripped into the slow cooker.’’ And, swallow. Traffic by Nick Sweeney is an altogether less sumptuous affair, shocking in its honesty as a women contemplates selling her baby. A Trip Out by Juno Baker reveals another kind of love, from a far more protective narrator, who, while on the surface seems unreliable, but may in fact be saner than you or I. By now we’re wading fast from isle to isle, trotting from one story to the next as the waves lap cheerily. Even an attempted suicide can’t dampen our spirits as A Debt by Dan Coxon leads us into the life of an accidental and not entirely willing hero. Judy Birkbeck’s Trap brings us to the partial isolation of country living, and the vicious side of a rural idyll, while Scapegoat by Tim Love rushes us back to the minutiae of modern life and all the regrets that can accumulate. Gordon Collin’s You May As Well Give Up Trying To Make Something of Yourself is loaded with wit, with an edge of surreality, as a man returns from hospital after having a kidney removed, and has to face some unexpected responses to his surgery. It’s a finely balanced tale, curiously enjoyable as we wander off course into previously uncharted territory. My Knee by John D Rutter is a slighter, but still satisfying story that ends in its beginning, with a flavoursome whack of violence in the middle. Tim Sykes’ Marlboro Country is more of a slow burn, easing you in then inviting you to stand back and witness a moment of quiet melancholic splendour. Exquisitely precise in her writing, Sarah manages to fold all the myriad layers morality and humanity into little over ten pages. Impressive. That leaves us with just three tales/islands to explore, and the next – Double Concerto For Two Violins by Jonathan Taylor – is a remarkable journey through music and genocide, with the reminder that even amid the very worst of human cruelty there can be moments of radiance. The penultimate offering is an uncommonly long (by which I mean five full pages) tale by flash queen Tania Hershman. About Time is an excellent example of writerly ease – reading this story is utterly pleasing, our narrator delightfully chatty, and the narrative full of wonder. And just as the protagonist of Rosie Gailor’s I made a choice, so does Roeloff’s, providing the sense of a circular voyage, with an abundance of islands worth revisiting at your leisure. Unthology 9 will be published by Unthank Books in April 2017. It’s available to pre-order from wordery.com and bookdepository.com. 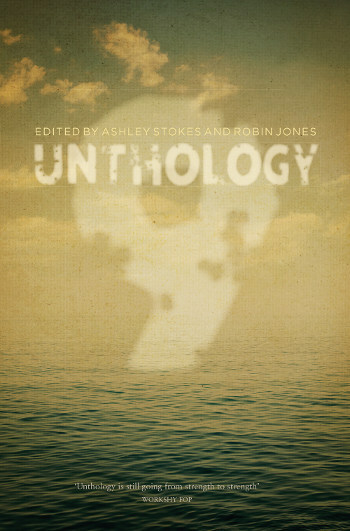 This entry was posted in Reviews and tagged short story anthologies, Unthank Books, Unthology 9 by Judy. Bookmark the permalink.